An exciting and heartwarming true story, of one man's adventures in response to the news that the Pope was coming to visit his hometown. Written in a narrative style, the reader is transported back in time with a ringside seat to the adventures and events leading up to the author's eventual participation in the festivities in Part 2 of the story during the Pope's visit, to hold World Youth Day VIII in Denver, Colorado, USA in 1993. JD is a Colorado native, with a wife and two sons, a service disabled Vietnam war veteran, having served five tours on Swift Boats. A graduate of the University of Denver, with a dual degree in finance and real estate, and currently owns a nationwide business in Denver. Drafted to serve was written on a nearly full-time basis during the last three years. 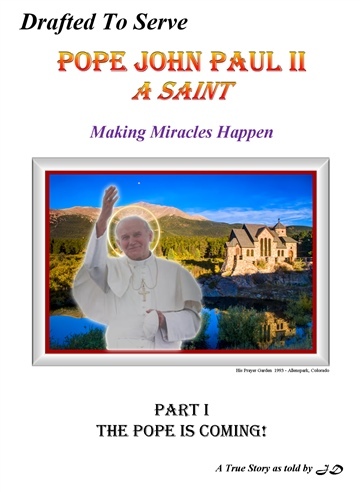 He felt compelled to write and share this story with the world about what actually happened when Pope John Paul II came to Denver in 1993. "I started reading this morning and then I couldn't put it down. I finished this afternoon… Let's make it a movie… Thanks for sharing this with me." "The content does indeed capture the reader. I was doing a happy dance, singing, 'This is why became an editor!, and my own dog looked at me like, 'lady, what are you doing?' I was certainly pulled into the story, and couldn't wait to read more. This is a must read for anyone who loves a good story captured in its own style ."